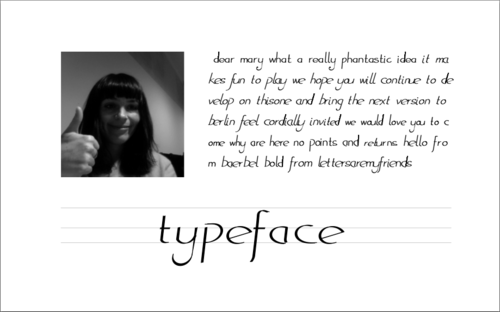 Have a look on her amazing project TYPEFACE – an approach on emotionally generated typefaces via faceexpressions. “The design of typefaces is founded upon principles from the days of metal type, when creating individual fonts was a laborious process and constrained by physical requirements. Most digital type design follows those same conventions, but technology gives us opportunities to make type design more spontaneous and personal. It’s based on openframeworks and easy to install…(even if it varies a lot depending on your light.) This is how it works. TYPEFACE alpha from Mary Huang. 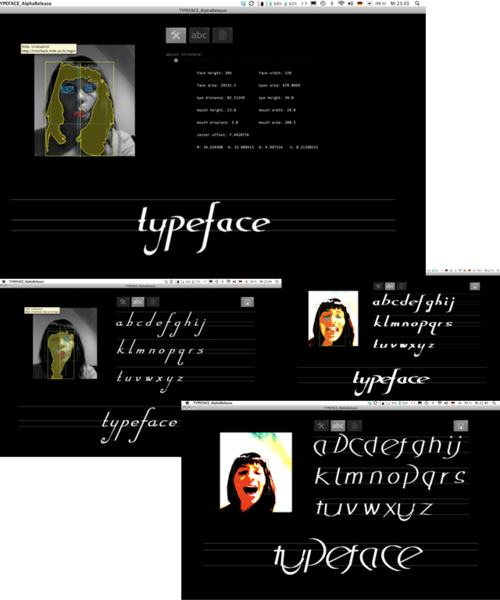 There is also an interactive writer which is generating a personal typeface as the message you type in while expressing your Face.. really complex thing, not so easy to handle both at the same time —- not even to explain… anyways amazing idea! Big Up Mary, we really wanna see you here in Berlin! Keep up the inspiring work.